PARTY-GOERS in London lambasted Bill Clinton for throwing the “worst party ever” this week. This might not be the first time Clinton has been accused of being less entertaining than promised (outside the Oval Office at least – oo er missus), but it’s surprising all the same. Bill was there with daughter Chelsea. Also present were Princess Beatrice, Will.I.Am, Lily Cole and Gwyneth Paltrow. In other words, guests had their pick of insufferably glamorous people to be made to feel inadequate by. So what could go wrong? Did Bill play the saxophone, or fail to play the saxophone (depending on where you stand on saxophones – personally I stand on saxophones wearing concrete boots)? Did he have that notorious buzz-killer Al Gore with him? Was he, heaven help us, handing out cigars? Well, no. The problem was just that the revellers had to wait a long time to get in, and the room was very crowded, and a bit whiffy, and the walls appeared damp. And Clinton spoke for only a couple of minutes (which is something like that restaurant complaint that goes, “the food was terrible and there wasn’t enough of it”). Note to self: never invite any of these people to a party: they’re obviously impossible to please. Worst party ever? Hardly. There is a near-infinite list of parties that have to be worse than the Clinton event. There’s the average office Christmas party, for a start. Then there are hen parties, where you’re expected to laugh uproariously at chocolate willies or be thought (probably not unjustly) a prude. What about a Murder Mystery Party where someone actually got murdered? That would be a bit more of a conversation-stopper than damp walls, wouldn’t it? Other nominees: Any party where the host shows photos of their trip to Machu Picchu. Any party where there are non-drinkers, sitting there the whole evening quietly taking it all in. Any party where the hosts have clearly had a row just before you arrived, and one of them is banging pots and pans around in the kitchen with a face on them that would stop a clock. Any party that features a conga line. Consider Kim Jong-Il’s 69th birthday party last year, when he broke with his custom of handing out gifts and the long-suffering people of North Korea got nothing? That was a bad party. You’d think if your birthday was a national public holiday, and you were the “eternal leader”, and you had so much power that you could actually control the weather, that at least you could stump up a jar of bath salts. Maybe competitive children’s birthday parties are the worst, with parents feverishly outdoing each other on the entertainment front. Life seemed easier when no one could afford a bouncy castle and parties just meant red lemonade and something involving desiccated coconut. But really, the worst bad party is the one you throw yourself. You invite 40 people and only ten show up. You put too much of yourself into the cooking, so that by the time the guests arrive you’re exhausted and irritable and wish they’d all go. When you finally finish with the food preparations, you return to your guests in the sitting room, only to find that all ten have somehow ended up sitting in a wide circle, mutely listening to slow jazz. One guest refuses the food: she never eats beef unless she actually knew the cow. You think to yourself: how did I end up inviting into my home someone for whom knowing the cow beforehand would be a good thing, rather than a bad thing? One couple arrive late – they couldn’t find a babysitter so they brought their two-year-old with them. Having thereby ruined your party, they give it up as a dead loss and leave early to go to the pub, taking the last few interesting guests with them. Eventually no one is left except one person whom you actively despise, who gate-crashed, and who at 4am is still there with a huge welcome for himself, drinking wine by the neck and singing ‘Wonderwall’. Give me a conga line with the Clintons any day. Certain mysterious events took place over last weekend, events which have not been and indeed are unlikely ever to be accounted for. At any rate, soon after these events took place, our hero disappeared amid a hum of speculation. Before long, social media was buzzing with rumours and jokes as to his whereabouts and his intentions. Could his people really have lost him, after four decades? Was this the end of a generations-old tradition? Could he be dead to them now? Then, a day or two later, having led everyone up the garden path and down again, he emerged – looking a little soiled but otherwise acting normal – from the hole he had dug for himself. His beady eyes blinking in the inadequate sunlight, he revealed he was perfectly satisfied with his current circumstances and had no intention of leaving. Reactions to the news included relief, bemusement, embarrassment and mirth, but our hero was oblivious to all that. After he’d had a nice meal, he merely waited serenely for an invitation to go on morning radio. You think this is about Eamon Ó Cuiv, don’t you? In fact I’m referring to Florentine the 100-year-old tortoise, who vanished from his home in Rathgar, south Dublin, at the weekend, or so his family thought. They notified the gardaí of the disappearance, put posters up about the place, and launched a campaign to find him on social media. This was only a moderately good human-interest story but, partly because it presented an unmissable opportunity to pun (‘shell-shocked’, ‘shell-ebrity’ etc), and partly because everyone wanted to know exactly how far you could get in Rathgar at 0.17 miles an hour, the story grew legs, as it were. Soon the hashtag #rathgartortoise was a top trend on Twitter, and the item had been covered by most major news outlets. Another 24 hours and someone would surely have reported seeing a hare snoozing somewhere in Dublin 6, just to provide the fable with a second act. That or some boffin might have explored the James Joyce connection. Joyce was born just around the corner in Brighton Square; that “tortoise napecomb” he mentions in Ulysses could have come from one of Florentine’s luckless relations, and Florentine might have been bent on melodramatic revenge. Florentine was given a celebratory (gamely resisting the temptation to say shellebratory there) meal of lettuce, followed by a pudding of strawberries, and was taken more or less immediately to the RTE studios to be photographed with John Murray. ‘Ireland breathes sigh of relief as 100-year-old tortoise found!’, exclaimed the BBC, even though we’ve asked the BBC a thousand times not to exaggerate. “I will continue to work from within, to serve the party,” said Florentine. Oops, sorry, silly me, confused again. Of course he didn’t say that. He was, however, photographed looking a bit daft. I’m not confused on that score. It’s something he really should be more careful about, as he is by no means as daft as he looks. Don’t say another word about it. Pets are inherently embarrassing, as anyone with a dog (‘I want to sniff your privates’) or a cat (‘I want you to sniff my privates’) will tell you. The wonder is that Florentine has lived with the same family for 40 years and yet never embarrassed them before. There must have been countless ways to embarrass a 1970s Dublin family if he’d only used his imagination. Anyway, everyone understands how it feels to make a big fuss about something that turns out to be nothing, or to indulge in a spot of attention-seeking and then regret it. Developed a bunion and assumed it was cancer? Lost your temper about something that was your own fault? Imagined yourself insulted? Took a principled stand about something – an austerity treaty, say – and then had a change of heart? Step forward, anyone who has never been a bit of a drama queen. 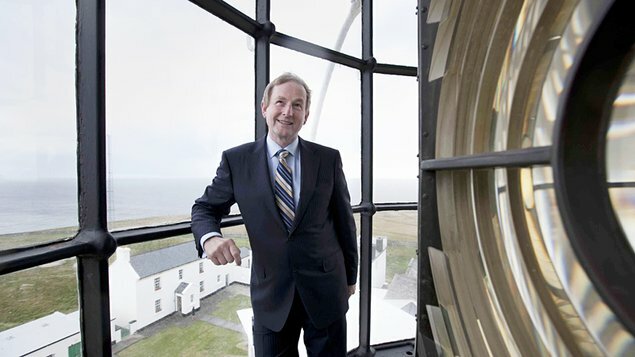 Where do you think you’re going, O Cuiv?